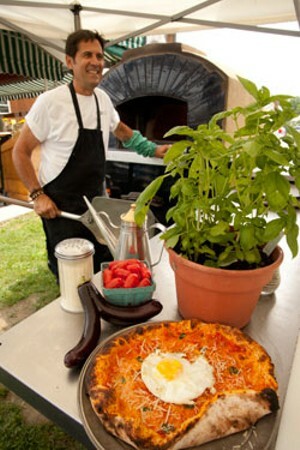 It’s hard to deny that 2012 is Vermont’s Summer of Pizza. On Burlington’s St. Paul Street alone, Sofia’s Pizzeria will soon join brand-new Pizzeria Verità, just down the street from American Flatbread — Burlington Hearth. Another Neapolitan pizzeria, Pi Brick Oven Trattoria, opened in Woodstock at the end of July. But slice fanatics can nosh at those restaurants anytime. More elusive are the pizzas of summer — the ones that emerge from mobile ovens at fairs and farmers markets all over the state. In recent years, Vermont has seen more and more of these mobile ovens dotting its highways and byways. The trend started in 2006, when Enid Wonnacott, executive director of the Northeast Organic Farming Association of Vermont, got a Sustainable Agriculture Research & Education grant. Her project: to transform the food served at Vermont’s agricultural fairs. That didn’t go well. “Basically, the feedback I received was ‘People come to fairs because they like to eat fried dough,’” remembers Wonnacott. So NOFA-VT took its oven on the road. Interns now bring it to farms and events all summer long, where they cook up pies using ultra-local ingredients, often grown on-site. As the oven made its early rounds, says Wonnacott, it inspired other Vermonters to purchase their own ovens and start for-profit businesses. While some of these descendants share NOFA-VT’s goal of promoting local agriculture, others simply want to serve festive food to summer crowds. Creativity motivates some mobile pizza chefs; others concentrate on baking pies that would make an Italian grandmother shed a joyous tear. We introduce you to five of the best. “‘Seven days without eating a slice of pizza makes one weak,’” quotes DeAnna Mach. Her uncle, Eric Mach, coined the phrase to describe the devoted pizza chef and her yen for pies. Twelve years ago, that same Uncle Eric built Mach’s original brick oven in a building overlooking Pawlet’s Flower Brook gorge. There, Mach baked as many as 545 crusts a day, which she vacuum-sealed and sold at stores across New England. Tropical Storm Irene’s floodwaters all but destroyed the bakery, which is just becoming active again. Meanwhile, though, Mach has another way to share her pizza with Vermont. In 2009, Mach first hit the road with a custom-made, 6200-pound copper oven. At 1100 degrees Fahrenheit, it takes less than two minutes to cook one of her floppy, thin-crusted pizzas. The quick prep allows her to offer lots of topping options. A longtime member of the Vermont Fresh Network, Mach likes to serve ingredients native to wherever her oven lands. In rawlet, she uses cheeses such as Vermont raclette from Southwind Farmstead and Consider Bardwell Farm’s creamy cow’s-milk cheese named for the town. The latter is luscious on Mach’s basic cheese pie over fruity, chunky fire-roasted-tomato sauce. At this year’s Vermont Cheesemakers Festival, Mach paired spicy Vermont Smoke and Cure pepperoni addictively with Blythedale Farm’s Cookeville Grana. But best of all was her pizza featuring a bed of slightly sweet Maplebrook Fine Cheese ricotta dressed with peaches that Mach’s brother-in-law had just brought from Georgia. Boucher Blue cheese and mint contributed complementary creamy and bright notes, while fresh arugula added crunch. Peoples Academy in Morrisville was the site of Jonah Bourne’s first oven. Almost a decade ago, the high school won a grant to teach students to build a clay oven — a lesson not lost on Bourne, who quickly realized he had a culinary passion. After college, he traveled to California, where he worked on farms and in bakeries. Then he returned to Vermont to start his own. In 2007, Bourne and his business partner, Jeremiah Church, built their oven using mostly salvage materials. By 2010, their 160-acre Provender Farm in Cabot was providing them with most of their toppings. The result is a fluffy sourdough crust dressed with lots of fresh veggies. The crust has a local heritage of its own, with the flour coming primarily from Gleason Grains in Bridport. On a recent Saturday at the Capital City Farmers Market, Bourne served a pie topped with crispy kale leaves that crackled like potato chips over skinny slices of fennel and onion. Meat toppings are also local. A neighbor in Cabot provides ground beef, while Bourne and Church make their own sausage from Tangletown Farm pork. 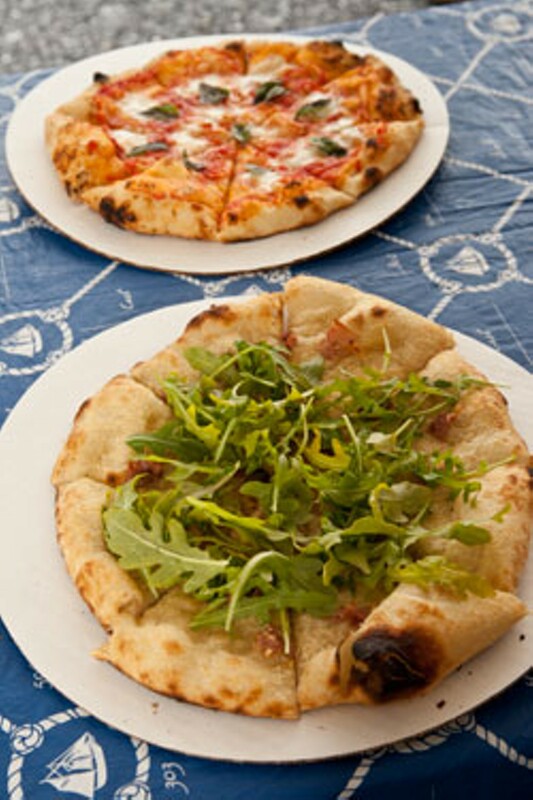 On one pizza, they use local bacon to play foil to Provender’s own juicy pears and blue cheese from Bonnieview Farm. Eggs, too, come from Provender Farm’s chickens. They make a guest appearance on one of Bourne’s favorites: a breakfast pizza with bacon, garlic scapes and cheddar. If Peoples Academy had never received that grant, Vermont might never have tasted a slice of WoodBelly. “It’s funny how life works out sometimes,” says Bourne. It looks simple enough at first: a base of tangy, crushed San Marzano tomatoes topped with grated Parmesan. Then there’s the cream, a wash of it that soaks into the chewy crust. But the final ingredient of the Panna pizza is what defines it: an egg fried inside a single-serving pan in the 900-degree oven. It breaks as the pizza is sliced and turns into a viscous, hollandaise-like sauce as it mixes with the cream. Customers at Sam Mazza’s Farm Market have been loving Papillo’s pies since 2010. His menu has grown from two kinds of pizza per weekend to more than a dozen, all sold as whole, 12-inch pies. Many use seasonal ingredients from Mazza’s. Last weekend, Papillo’s wife, Debbie, carefully showered the crusts with mascarpone, maple-glazed walnuts and Mazza’s blueberries before handing them over for a mere 90 seconds of baking in the oven. She topped other pies with herbs the family grows at home. Despite his Italian name, Charlie Papillo says he rarely ate the cuisine growing up, owing to his father’s premature death. It was Debbie’s grandmother who introduced him to braciole and slow-cooked Sunday gravy. After years of study at her side, Papillo says, he began to dream of opening a pizza shop of his own. His full-time job forced him to defer that dream, but cooking on the weekends made sense. Papillo had his Italian Forno Bravo oven custom-built in Colorado. For a personal touch, his son, artist Charles Papillo, crafted the tiles that decorate the oven’s opening. The younger Papillo, a San Francisco resident, helps out baking pies when he’s in town, along with sister Stefanie, a fixture at Mazza’s. Neapolitan pizza may be newly trendy in Vermont, but Jeffrey Fox has been a fan for years. After trips to some of America’s greatest pizzerias, such as the Original Frank Pepe Pizzeria Napoletana in New Haven, Conn., and Pizzeria Bianco in Phoenix, Ariz., the stay-at-home dad and skillful home baker ventured to replicate the recipe on his own. A bite of his thin but pillowy crust shows he succeeded. A smattering of brown char colors the crisp edges of Fox’s Margherita. The tomato base blares with acidity, softened by the tastes of roasted garlic and clumps of Italian buffalo mozzarella. Before cutting the pie, Fox’s wife, Sue, scatters fresh basil on top. This is the second year that the Foxes have parked their trailer, which bears the license plate “PIZZA,” at the picturesque Point Bay Marina in Charlotte. Before that, Jeff Fox baked his wares at Lone Pines Campsites in Colchester in an oven made of soapstone left over from a home-kitchen remodeling. Fox’s new, lighter oven is the fruit of a chance meeting in line at Staples with a former pizza maker who needed to unload it. At the Foxes’ trailer, customers order whole pies rather than slices, then head up to the marina store to grab a drink. Settled on the dock, they can dig into a traditional pizza — such as one with prosciutto and truffle oil — or a quirkier one such as Fox’s signature seafood pie, with hand-sliced escargots and Maine baby shrimp in a garlic-and-shallot-infused butter sauce. It’s an elaborate finish to a process that Fox says starts with just four ingredients. What made onetime restaurant owner Chris Jones jump headfirst into the mobile pizza business? “I saw someone else doing it, and I said, ‘OK. Game on,’” he recalls. That competitive spirit has gotten him far. Open Hearth Pizza is the only oven in our survey that bakes meals seven days a week. This is the third year that Jones has fed visitors at Waterbury’s Ben & Jerry’s factory, but the first year he’s using a new refractory oven that sits in the back of a 1947 Chevy truck. Manned by as many as four other employees, Jones’ original oven now makes the rounds of farmers markets, where he buys many of his ingredients. “I’ll trade a slice or two with David Hartshorn [of Hartshorn’s Farm Stand & Maple in Waitsfield] for spinach and tomatoes,” he says. Jones’ connections with Mad River Valley restaurants supply him with meat for his pies. Open Hearth rents kitchen space from Localfolk Smokehouse in Waitsfield, and one smoky pizza features the barbecue joint’s pulled pork, along with sauce and bouncy smoked mozzarella from Maplebrook Fine Cheese. Chunks of juicy garlic links from Vermont Meat Company, also of Waitsfield, are among the sausage options. Though he loads on the local ingredients, Jones differs from many oven owners in not describing Vermont agricultural promotion as his business’ raison d’être. Winters take him to Florida, where he bakes pizza made from ingredients grown at small farms in the Tampa area. Wherever he brings his oven, Jones says he’s just excited to make interesting pizza and share it with the community.